Renault SA is preparing for a shift in leadership, with Chairman and CEO Carlos Ghosn said to be ready to resign more than two months after his arrest in Japan for alleged financial crimes rocked the world’s biggest car-making alliance. The French company’s board will meet Thursday and is expected to appoint Michelin chief Jean-Dominique Senard as chairman and to make interim Chief Executive Officer Thierry Bollore’s role permanent, said a person familiar with the matter, who asked not to be identified discussing private matters. Renault is negotiating with Ghosn over the terms of his departure and he is ready to resign under the right conditions, a person with knowledge of the talks said. The French state, which is Renault’s most powerful shareholder with a 15% stake and two board seats, is backing Senard for the chairman role. "Senard would be an excellent chairman of Renault," Finance Minister Bruno Le Maire said Tuesday in an interview on BFM TV. Le Maire didn’t comment on Bollore. Renault board members and Ghosn’s legal team are reviewing issues including his non-competition agreement and pension benefits, people familiar with the matter said. A spokeswoman for the Ghosn family declined to comment. Le Maire said the interim management at Renault hadn’t received a letter of resignation Tuesday evening Europe time. 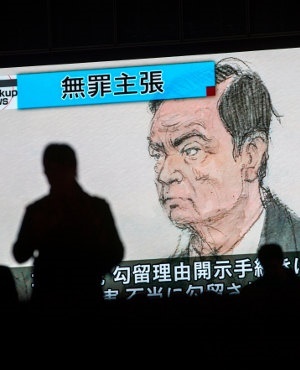 Ghosn, 64, has been held in custody in Japan since November 19, accused of crimes that could put him behind bars for decades. The auto titan has been indicted for understating his income at Nissan Motor by tens of millions of dollars and transferring personal trading losses to the carmaker. His latest bail application was rejected Tuesday. Ghosn has denied wrongdoing. Already ousted as chairman of partners Nissan and Mitsubishi Motors Ghosn has kept his posts at Renault and as the head of the alliance between the three automakers. The French company cited the presumption of innocence in keeping him on while appointing interim leaders. Now the board is studying the consequences of dismissing Ghosn, or of a voluntary departure should he choose to resign, one of the people said. A Renault spokesman didn’t return a call requesting comment on the succession. Ghosn’s downfall, as sudden as it was unexpected, has roiled the two-decade pact between Nissan and Renault, which he dominated as chairman of both companies and of the entity that governs their partnership. Le Maire and Nissan CEO Hiroto Saikawa were quick to downplay a report in the Nikkei newspaper over the weekend that the French side was planning to put the two carmakers under one holding structure. The next step could be naming a leader of the alliance. An elevation to CEO would technically put Bollore in a position to head the partnership, based on the rules currently governing it. Those rules specify that Renault’s CEO is also the head of the Amsterdam-based venture that manages the alliance, Le Maire has said. Yet on Tuesday, Le Maire laid out a different vision. While expressing support to split Ghosn’s posts, he said the "absolute priority" of the next chairman would be to strengthen the alliance, while the chief executive would be responsible for the day-to-day running of the company. He called Senard an excellent candidate as chairman. Bollore, a 55-year-old Frenchman who started his career with Michelin, was put in line by Ghosn as his successor at Renault. After he was appointed chief operating officer last year, Evercore ISI analyst Arndt Ellinghorst wrote that he may be perceived as a "more caring custodian of French jobs and interests." Ghosn’s most recent bid for release on bail was denied even after he offered to remain in Japan until his trial, turn over his passports, wear an electronic tracker and be monitored by private security guards, all at his own expense. At a hearing on January 8, the judge said Ghosn’s continued detention was due to him being a flight risk and the risk of witness or evidence tampering.